Google is making good on its promise to bring back free voice calls in Gmail, after temporarily removing them a couple months ago. 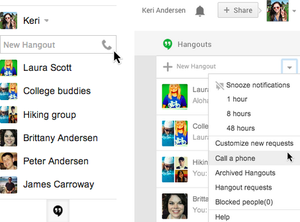 Voice calls disappeared from Gmail in May, when the company replaced Google Chat with a new feature called Hangouts. While Hangouts still allowed users to make video calls and receive calls to their Google Voice numbers, the ability to make outbound calls to landlines and mobile phones was missing, at least for a little while. Over the next few days, Google will roll out an updated version of Hangouts, restoring outbound voice calls and adding new features to the service. Users can now create a group call by adding multiple phone numbers, and can have mixed calls with some recipients on voice and others on video. Google's also throwing in some silly effects, such as applause and laughter, through the Google Effects app. Calls within the United States and Canada will remain free. (Last we heard, Google had extended free calls through 2013; we've reached out to Google to see if it'll stay that way indefinitely now.) 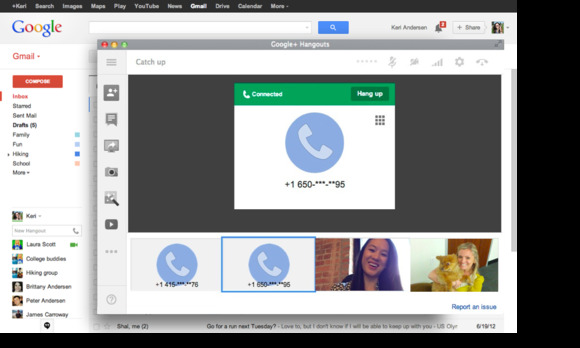 Hangouts users in other countries can now call the United States and Canada for free as well. Calls to outside the United States and Canada are still subject to various per-minute rates. So far, there's no word about whether SMS messaging will be brought back to Gmail, but chances are it'll show up eventually. Google has said that Hangouts is “designed to be the future of Google Voice,” so it seems likely we'll see more integrated Voice features, such as SMS and voicemails, over time. (Here's hoping we do, at least.) For now, you can still send text messages from your Google Voice number using the Google Voice Website. Google says voice calls should be available over the next few days, appearing as a phone icon on the right side of the “New Hangout” box. 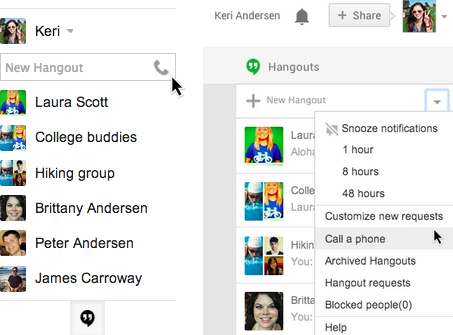 Users will also be able to make calls through Google+ and the Hangouts Chrome extension, using the drop-down menu on the right side of the “New Hangout” box.